The following is the latest in a series of occasional dispatches from DIRELAND's Rome correspondent, longtime ex-pat journalist Judy Harris, former Italian correspondent of the Wall Street Journal, who has lived in Italy for decades. With customary statesmanlike elegance the Italian premier and billionaire financial tycoon Silvio Berlusconi (left) remarked the other day that politics is "breaking his balls," and that he is "bored." 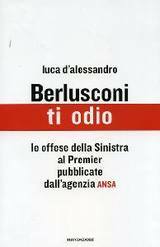 Well, so are we all, and no less so because today , one of the many publishing houses he owns (Mondadori) issued a new book, at his personal suggestion, called Berlusconi ti odio (I Hate Berlusconi, right). In it are 500 insults which he has received from "leftists." Thief is only one of the epithets. Was it boredom that prompted him to do this? More likely he has a canny political purpose. The single richest and most powerful man in Italy has always enjoyed painting himself as a victim: what better way? The problem with this is, for the rest of us, he gets away with it. On Wednesday, his flagging spirits, if not ours, were further revived when a docile Parliament finally approved the the so-called judiciary "reform" bill which Berlusconi, a frequent object of judiciary interest, has been itching to see passed for years. Now it has, and the political independence of the Italian judiciary will be reined in, or, as he would put it, will be less "politicized." The feisty, eighty-something President Carlo Azeglio Ciampi (left) did what he could to block the bill, and the magistrates themselves opposed it with such fervor that they took the unusual step of calling three full-scale courthouse strikes to show their opposition. Feelings ran particularly high in Sicily, where the Mafia continues to thrive, and where the memories are still fresh of the brutal murders fifteen years ago of investigating anti-Mafia magistrate Giovanni Falcone (right) and his close and affectionate colleague, the prosecutor Paolo Borsellino (lower left, the two judges together) -- 150 judges wearing black togas marched to the square in Palermo named in memory of the slain anti-Mafia judges, Piazza dei Martiri (Martyrs' Square). On the face of it, the reform bill has a quality or two that are not a priori evil, to use the going word. Although the new law augments bureaucratic authority over the judiciary, it obliges judges and prosecutors to follow distinctly separate career tracks, which is not in and of itself negative, and, in what would normally seem a positive step, it provides for promotion by merit rather than via that beloved Italian institution which provides for getting ahead in life, seniority, meaning that as long as you reach the office and sit in your chair, you will advance automatically. But there¹s the rub. To receive a merit promotion the magistrate or prosecutor must take special courses and examinations, meaning that, as one irate judge observed, "The magistrate who studies all day for the examination and does not bother to do any work will get promoted ahead of the person doing the work. What sense does that make?" My personally favorite bizarre clause makes a psychological test obligatory. Its purpose is to ensure that the future magistrate or prosecutor has the right kind of personality to serve as a judge. Anyone who cannot see the possibility for a political fix in this personality testing need not bother to read on. There were predictable moans of protest from the battle-weary Italian left, which stretches from the cashmere Communists of Fausto Bertinotti, at left (the Partito della Rifondazione Comunista) to the moderate progressives who back the Catholic Romano Prodi (right), a soft-spoken, cycle-riding, orthodox pro-corporate economist. National general elections are almost certain to be held next spring, and the campaigning has already started. This splintered, fractious left will have to peddle hard to get ahead. Although it fared well in recent local elections, Italian voters tend to vote one way over local administrations and another way when it comes to the national government. Just as Tony Blair¹s position has been reinforced by the terrorist attacks on subway and bus lines, so the threat of terrorism in Italy is looming as a distraction which may revive Berlusconi¹s position. Presumed credible threats from terrorists warn that, unless Italy withdraws its contingent from Iraq within thirty days, the country will be a target. But yesterday, the same day when the body of a young Italian woman who died in the London underground was returned home to Italy, the Italian Parliament formally voted to maintain its contingent in Iraq for the coming six months.